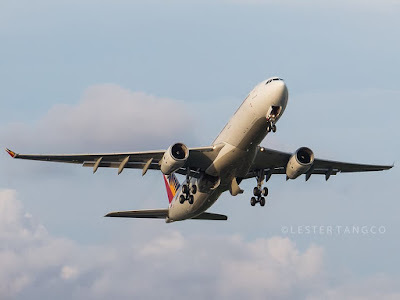 Aviation Updates Philippines - Parent company of Philippine Airlines Incorporated stayed in the black for the first half of the year 2015 due to newly launched routes and lowered oil prices. Philippine Airlines booked a net income of P5.86 billion of the first six months of the year compared to last year's P560.25 million net income. The airline reported a revenue of P55.94 billion this year -- increased by 14.3 percent -- while PAL Inc. earned P48.95. According to the PAL, passenger revenues went up by 15 percent to P47.17 billion from P41.01 billion. Passengers were mainly coming from United States of America (including Canada), Australia, Japan, and Middle East routes. The increase in passenger volume were the effects of interlining with PAL Express in the domestic sector. Philippine Airlines' operating expenses grew by 5.5 percent to P50.6 billion in the January-June period compared to P47.97 billion in the same time last year. Maintenance costs also soared 47.7 percent to P5.55 billion from P3.76 billion last year. However, flying operation expenses decreased to P30.04 billion from January-June of this year compared to P30.26 billion of last year. Aircraft leases increased to P2.6 billion due to delivery of new Airbus A330s and Airbus A321s. Meanwhile, expenses for passenger services grew by 12.8 percent to P4.28 billion from P3.79 billion due to increased costs of cabin crew benefits and passenger food. The growing of expenses was also caused by the increase of number of flights both in the domestic and international sector. To cut expenses, Philippine Airlines decided to take delivery of only 5 Airbus A321 aircraft -- instead of 10 -- this year. The remaining 5 orders will be delivered by 2016. Bautista also said that the deferral of order will not have any additional costs that might be imposed by Airbus. "Passengers were mainly coming from the United States of America" is very misleading. It should instead read "...coming from the Americas" to include Canada as well. Why would PAL fly daily to Canada utilizing their B777's? Please be responsible in your reporting. Americas?? North America and South America?? Common sense, do they fly to south America? I am just quoting the original news articles that came up where the term "Americas" was used. Point is, don't rewrite an article to appear original from you. Just share the link in Facebook. Tanga ka na nga sa geography, mayabang ka pa... Hahahahhahaa!!! Sorry but I don't stoop down to your level! Good day. The article originally came from the Philippine Star. The source should have been stated below the article but has not been saved while editing. To do further action about the comments you gave, the article has been edited to add the word "Canada" in the report. We will make sure to state the original source of the report and to double-check any errors in order to avoid mistakes. For any errors on facts given, please do inform us. Thank you and once again, good day! Thank you Dirk for correcting. I am from Canada myself and a loyal mabuhay miles member of Philippine Airlines. More power!